Updated to iOS 9 beta? Want to downgrade back to iOS 8.3? Fortunately, you can as Apple’s latest public release iOS 8.3 is being signed, meaning you can downgrade back to the more stable release using iTunes right now. It is important to note that once you downgrade back to iOS 8.3 from iOS 9, you won’t be able to restore any full device iOS 9 backup you made on iCloud or using iTunes, this is because backups made on iOS 9 are NOT backwards compatible to work on iOS 8. You will either have the choice to restore to a old backup made on iOS 8.x, or start from scratch on iOS 8.3. You’ve been warned. 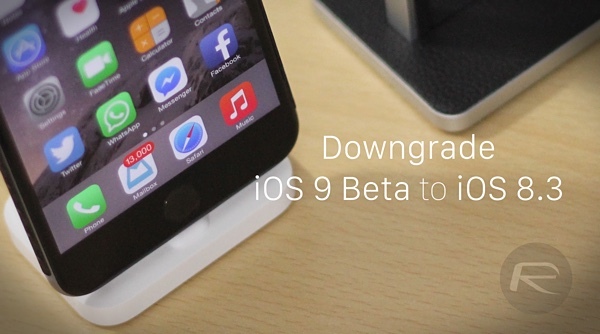 The following tutorial will help you downgrade iOS 9 beta to iOS 8.3 on any iPhone, iPad or iPod touch. Step 1: Update to the latest version of iTunes on Windows or Mac. Step 2: Download iOS 8.3 for your specific iPhone or iPad model from here. Step 3: Turn off Find My iPhone by navigating to Settings > iCloud > Find My iPhone and turn the toggle to off. Step 4: Connect your iOS device to your Mac or Windows PC and launch iTunes. Step 5: Now you will need to enter DFU mode. To do this, hold down both Power and Home/Touch ID buttons for 10 seconds, then release the Power button but keep holding the Home/Touch ID button until you are in DFU mode. iTunes will show you the following confirmation. Step 6: In iTunes hold the Option key on Mac, or the left SHIFT key if you are on Windows and then click on the ‘Restore iPhone…’ button. Step 7: iTunes will now prompt you to select the IPSW file you want to restore to. Point it to iOS 8.3 firmware file you downloaded for your device in Step 2 above. Step 8: Now iTunes will start the restore/downgrade process. This may take a while, do not disconnect (read: unplug) your device from your computer at this stage. After a while, your device will reboot right into Hello welcome screen of iOS 8.
iOS 9 is currently available as beta to registered members of Apple Developer Program. Apple plans to release it as public beta next month. You can sign up for iOS 9 public beta program by following our guide here: Sign Up For iOS 9 Public Beta Program Right Now, Here’s How. Final version of iOS 9 will be released to public this fall alongside iPhone 6s and iPhone 6s Plus. Can you post an article on how to downgrade your Apple Watch as well as it won’t work with an iOS 8.3 device.